Benjamin Franklin (using the pseudonym Richard Saunders) began publishing Poor Richard’s Almanack on December 28, 1732. Poor Richard’s Almanack included a calendar, weather, agricultural predictions, charts of the moon’s phases, practical household hints, poems, proverbs, puzzles, and the occasional mathematical exercise. Many of the witty, clever sayings that are associated with Franklin (such as “haste makes waste”) come from the pages of Poor Richard’s Almanack. One of America’s Founding Fathers, Franklin continued to publish his Almanack until 1758. In 1732 I first published my Almanack, under the name of Richard Saunders; it was continu’d by me about 25 Years, commonly call’d Poor Richard’s Almanack. I endeavor’d to make it both entertaining and useful, and it accordingly came to be in such Demand that I reap’d considerable Profit from it, vending annually near ten Thousand. . . . I consider’d it as a proper Vehicle for conveying Instruction among the common People, who bought scarcely any other Books. I therefore filled all the little Spaces that occur’d between the Remarkable Days in the Calendar, with Proverbial Sentences, chiefly such as inculcated Industry and Frugality, as the Means of procuring Wealth and thereby securing Virtue, it being more difficult for a Man in Want to act always honestly, as (to use here one of those Proverbs) it is hard for an empty Sack to stand upright. After The Pennsylvania Gazette, Poor Richard’s Almanack was the most profitable enterprise that Franklin undertook as a publisher. Poor Richard’s Almanack also had a strong cultural impact in the years following its publication. The King of France named a ship given to John Paul Jones the Bonhomme Richard, or “Good man Richard,” after the Almanack‘s author. A later almanac by Noah Webster, The Old Farmer’s Almanac, was inspired in part by Poor Richard’s Almanack. Ben & Verse – On this website you’ll find quotations from Franklin’s Poor Richard’s Almanac, each with an interpretation as a snappy modern verse ‘jingle.’ The quotations are organized by subject – pick one from the list and start your journey through the wit and wisdom of Ben! 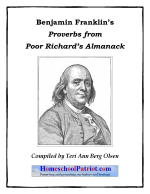 We’ve all heard the advice “Early to bed, early to rise, makes a man healthy, wealthy, and wise.” Benjamin Franklin had this to say and much more in his Poor Richard’s Almanack. A new e-book features over 100 of Ben’s best proverbs, along with lined pages for children’s copywork with appropriate quotes, as well as additional lessons and writing assignments for all ages. Have students choose a proverb, paraphrase it, and explain why they agree or disagree with its message. As a final activity, ask students to write their own mottos for life. This entry was posted in 900 Geography & History and tagged almanac, american history, founding fathers, franklin, proverb. Bookmark the permalink.